I’ve granted permission to Professor Emeritus Alvin O. Thompson, Department of History & Philosophy, University of the West Indies, Cave Hill Campus, Barbados, to use this photo. Dr. Thompson is writing a small book entitled Confronting Slavery: Breaking through the Corridors of Silence. 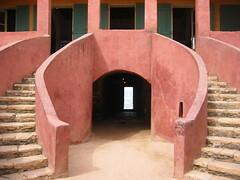 The photo was taken in the courtyard of the Maison des Esclaves (Slave House) on Goree Island, Senegal.